The indoor tabletop fountains are definitely has different specification and design than the same fountains used for exterior decoration. Few homeowners prefer using tabletop fountains among any other decorative object due to several reasons. 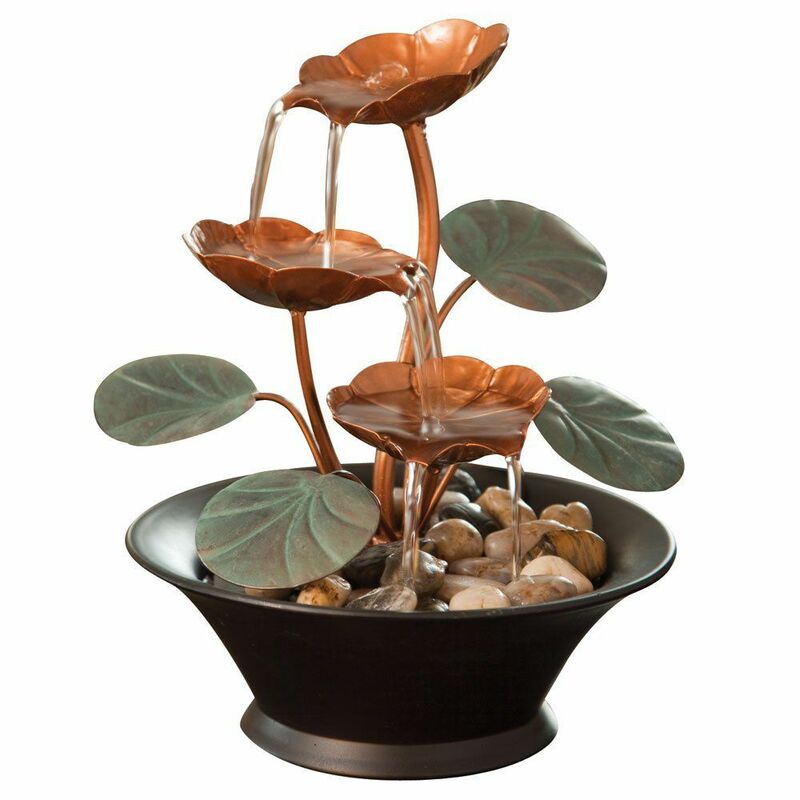 Besides it has artistic looking, tabletop fountains are also able to give relaxing ambiance. Bits and Pieces are one of the best manufacturers that produce unique tabletop fountains for interior decoration. Since it is design for indoor purposes, it has beautiful water lily design where the water flows gracefully from its flowers. The electric cord used to supply power for the pump is smartly placed so that it does not obstruct its beautiful layout. 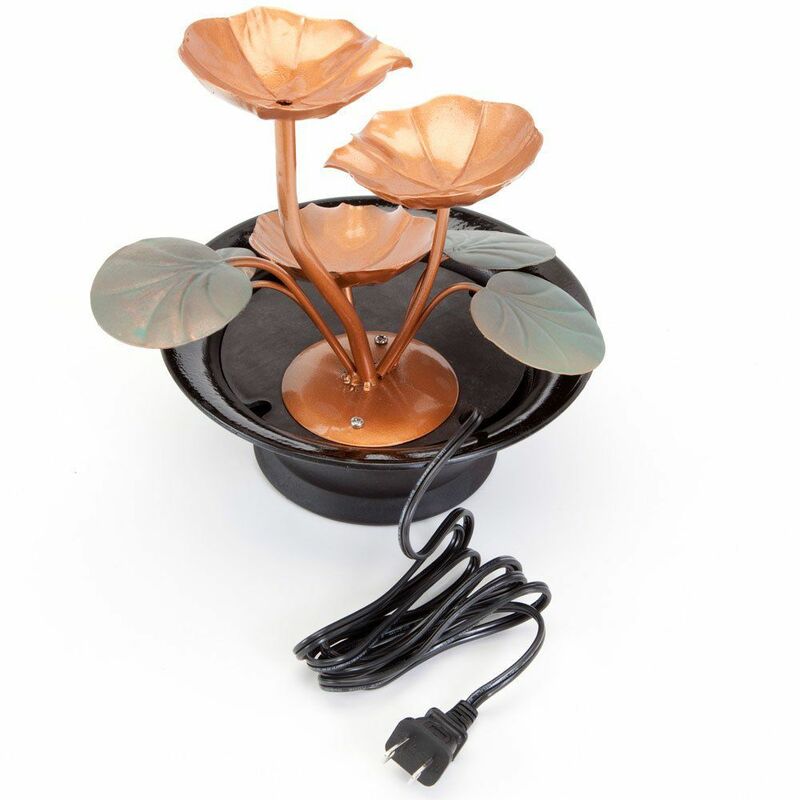 The water lily designed on indoor tabletop fountains manufactured by Bits and Pieces incorporates metal material for the flowers and clay material for its water container. The metal flower petals are design as temporary water container since it will flow to other flower petals located lower than the previous flower petals. Due to the petals arrangement, the water flows from one to other petal creates relaxing ambiance to the room. As the water reached the lowest petal, it will be channeled to water container in form of large clay pot with pebbles decoration in it. Besides three flowers of water lily petals, the design also includes four round leaves as you ideally see they grow along with water lily flower. 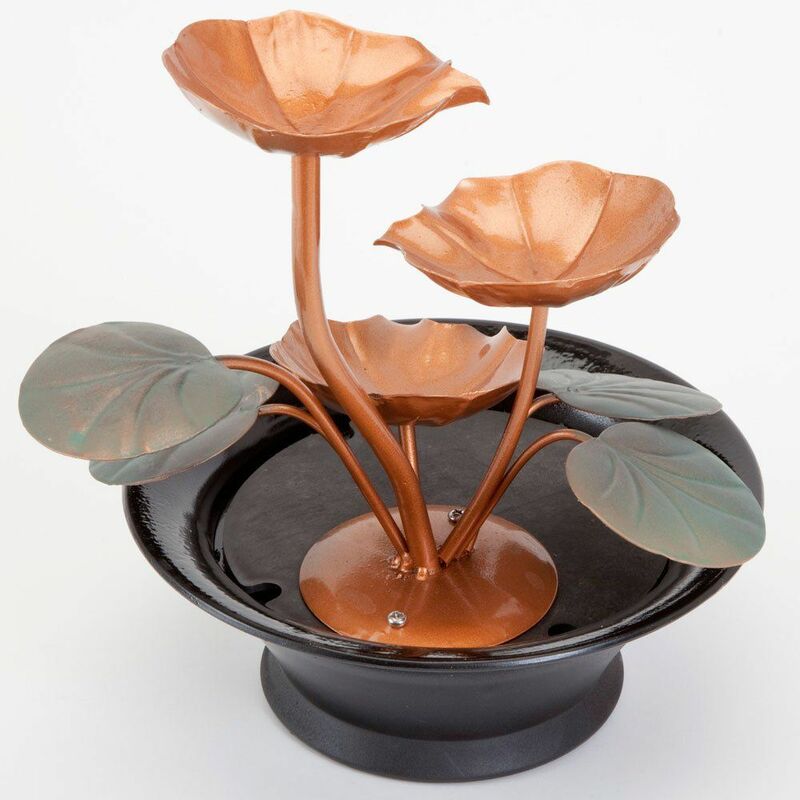 The water lily of indoor tabletop fountains is made out of metal in bronze color. Meanwhile, the dimension of this small indoor fountain is about 8 inch in diameter with height of 10 inch. It is suitable to be placed almost any room in your house to give decorative effect and relaxing ambiance. There is nothing tricky about the installation as the manual instruction if the installation comes along with the fountain parts in the package. It is important to use wooden table located close to power outlet since the electricity is required for the pump. After the designated spot is located, connecting the pump with electricity comes next. In order to make the waterfall fountains functional, the last thing you need is water to fill the container. 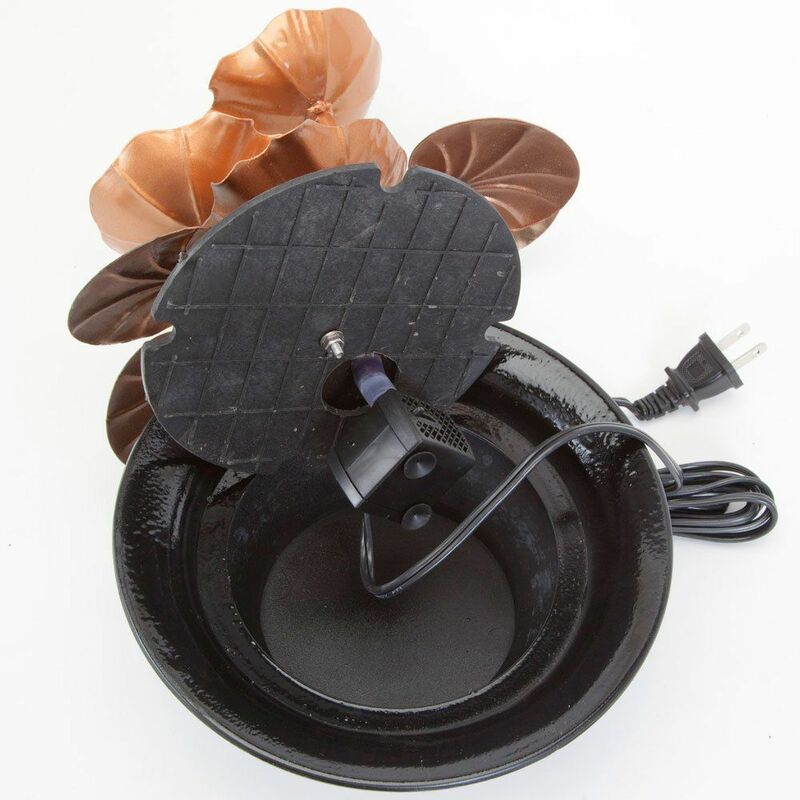 Let the pump do its job by absorbing the water and channel it to the highest water lily flower petal. 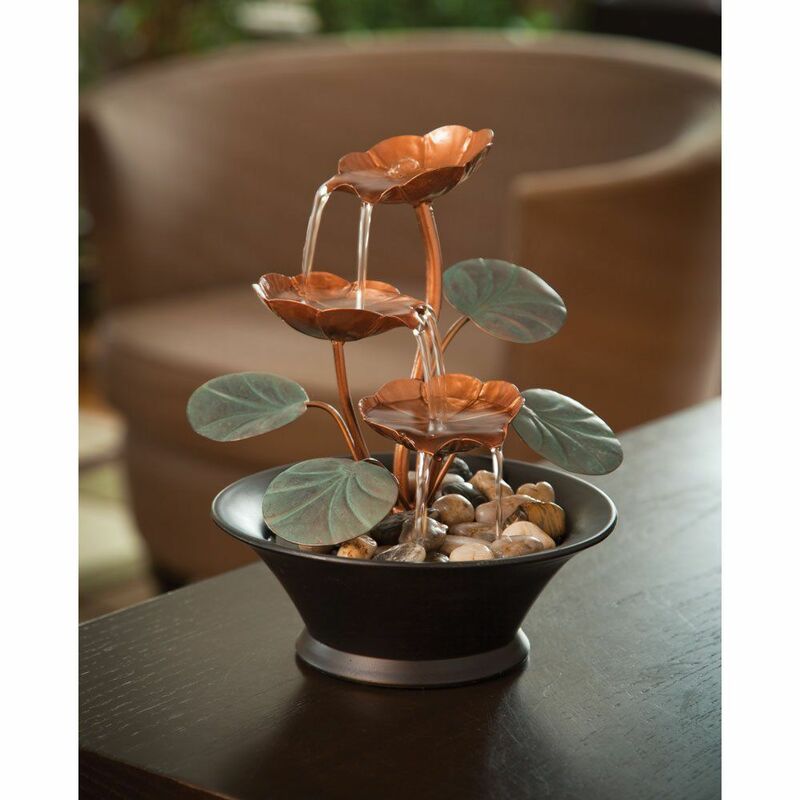 Adding pebbles on the clay water container of indoor tabletop fountains is also needed to cover the hose and to make complete its appearance.